Why David Denies is considered best in class? Because we combine sporting excellence with the highest level of total service: lodging and cuisine are provided at the most exacting standards. David Denies pioneered Argentine bird hunting in 1982. Since then we have developed the absolute best programs in South America, by focusing on what we believe matters the most to sportsmen—the best possible accommodations on the best hunting grounds enhanced by the best service. 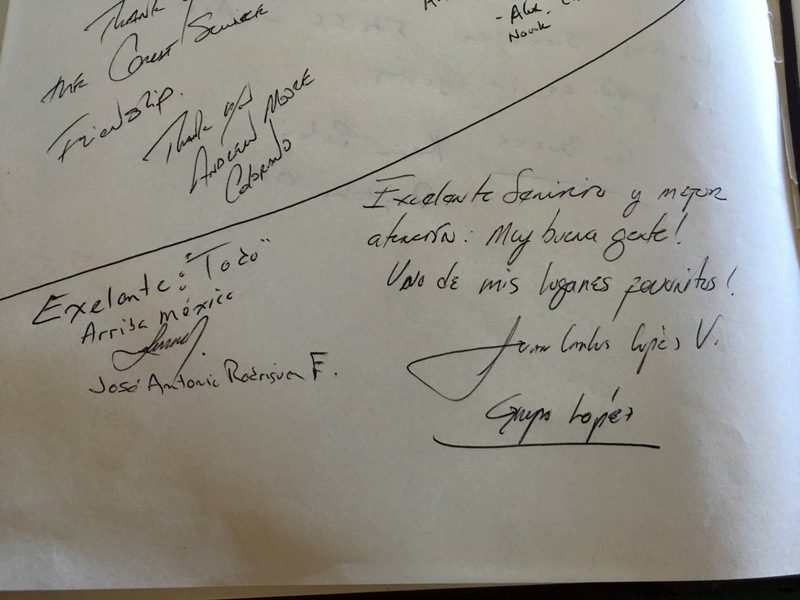 "First off, I think everyone in our group had a great time at Pica Zuro, we all really enjoyed all aspects of a spectacular trip. The physical accommodations were great, the old building has great charm and is perfect for a high quality hunting lodge. The individual rooms were first class, everything we needed. The service was great. María at the Lodge and Facundo took care of our every need. The food was wonderful, both in quality and quantity, María was there to make sure that if we needed anything it was provided. Facundo handled our transportation and made sure we knew the plan for each day of our hunt. He was involved with all of us (as María was also) and as a result we not only enjoyed their company but each member of our group knew the program, the plan for the next event and always felt fully informed. No one to my knowledge needed anything that was not provided or answered. The food at the hunts was really great, hard to beat good Argentine beef and pork cooked over wood fires in the field, topped off with a short nap in a hammock. Tough life! Our field assistants were really helpful, loading the guns and making sure we had water and other things to drink. Their very positive and professional attitude resulted in not only having someone there that was meeting our needs but also someone that we enjoyed being with and talking with. The whole trip was really a first class experience; this was my second trip to Argentina for shooting, but I lived in Bolivia for 2 years and traveled to Argentina many times and did a lot of shooting in Bolivia. So, I had some idea of what to expect on a first class hunt and those expectations were met or exceeded. I don't know what you could have done to make the trip any better. One key issue on shooting trips is guns. The lack of sufficient quality or quantity of guns can ruin a trip of this kind. Fortunately you had good shotguns, a good variety and were able to make changes or substitutions not only for mechanical problems that are to be expected with this kind of high volume shooting, but also to provide a variety when we wanted to just shoot something different. Thanks to all your staff for making our hunt a really enjoyable experience. PS, the photo book we had the opportunity to purchase at the end ( I think all of our group made the purchase) was a special treat for us to take home and show our family and friends, as well as just relive the great adventures. " 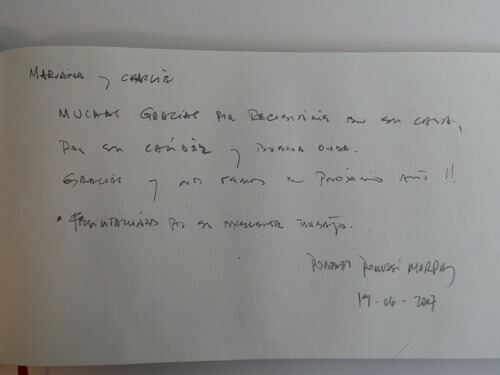 "Thank you very much for the warm hospitality and wonderful service. 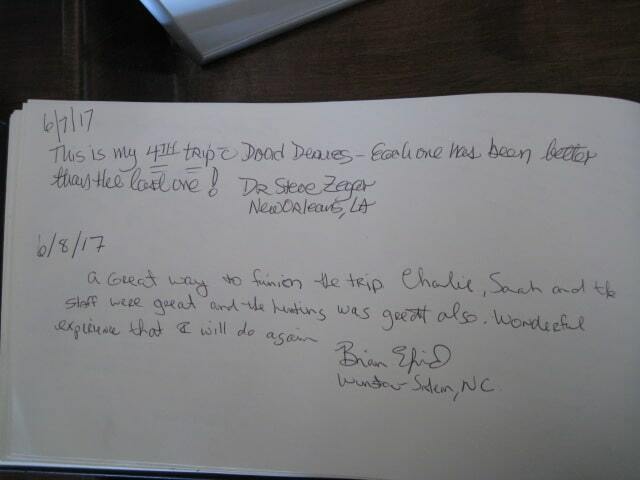 Chad and I had a great hunting experience with your staff at Pica Zuro, and we will be coming back in the future. Please extend our warm wishes to all the field staff and especially Guillermo for providing us with such a wonderful time. The food was so delicious and there was so much of it that we both gained weight on the trip! Thank you once again for taking such good care of us. 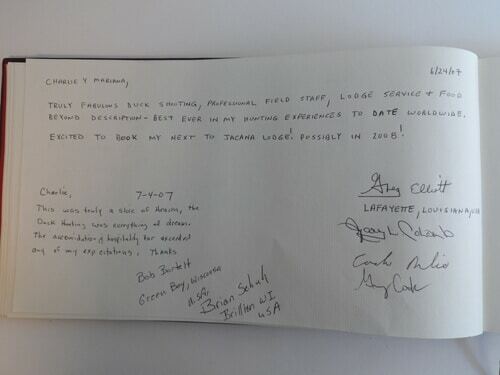 "I’d like to thank all David Denies organization for the most wonderful opportunity to hunt at Pica Zuro last week. The trip more than exceeded every hope and expectation I had. From the service, to the meals, to the shooting, everything was perfect. Never could I imagine shooting over 4200 rounds in 3.5 days! The lodge manager, Maria Capizzi, was an absolutely wonderful host. My field assistant, Lucas, was a trooper, loading all 4200+ shells for me, even on a 101+ degree day. All the field assistants and lodge staff treated us like royalty. I would have to say this trip ranked in the top three vacations I’ve ever been on (the other two being my honeymoon and 10 year anniversary)!You can most certainly use me as a reference for David Denies as I can’t imagine anyone having less than a spectacular time. "everything was perfect! The lodge was fantastic, Maria was an outstanding host, the food was wonderful, the hunting, of course, was amazing! Chelo did a fantastic job! Everything was set up perfectly, and I have nothing but praise for the whole operation! It was the hunting trip of a lifetime! "I was blown away with the shooting and with the quality that the members of this establishment holds themselves to. Absolute excellence!" "4 years in a row the best hunting experience I have had in 30 years + 10 countries." "I was told this was the best wingshooting experience in the world. 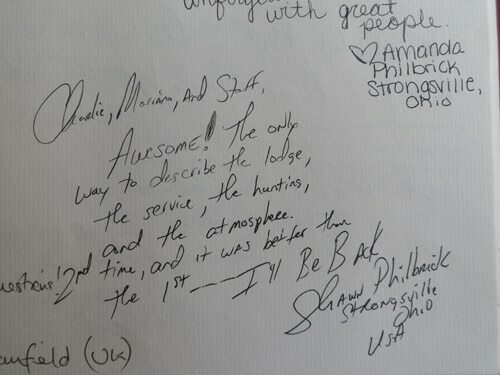 I agree 100%"
"The people, lodge, food, hunting was excellent!! We have used David Denies 4 times now & will definitely come back!! Joaquin & Diego were professional & did a great job! Thank you for everything!!!!" "We had a delightful time. From the pick up at the airport to the departure everything seemed to flow smoothly. The food was superb and plentiful. The hunts were, as always, terrific fun. 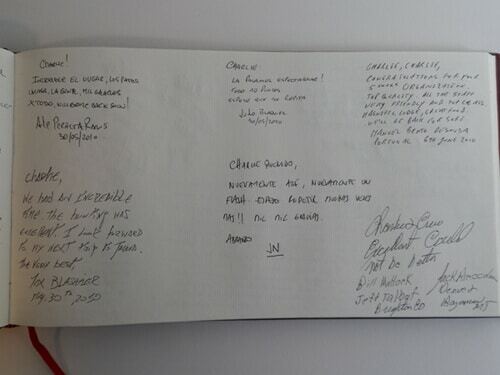 Overall an absolutely fantastic trip…"
"We had an excellent time at La Dormida. The only complaint from our group was that we didn’t stay long enough. Everything at the lodge was perfect – the setting, the accommodations and the food. I was very impressed with the logistics involved and they all handled them perfectly." "Service was exceptional. The amount of birds was as advertised, but the service was first class." 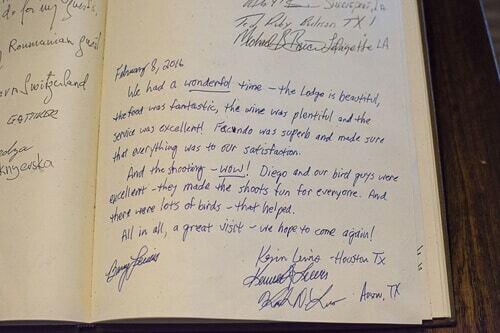 "The dove lodge was very nice. The hunting was very good and the field lunches were special. Thanks"
"The quality of service is exceptional. Our needs were anticipated and fulfilled. All this in an atmosphere of relaxed elegance." "The Barrans are exceptional hosts, and their staff are equally first rate. Their hunting knowledge, and the hunting are the best I’ve ever experienced." "The Barrans make you feel like one of the family. The quality and presentation of food is excellent and service always has a smile. I enjoy Bernados and Mercedes knowledge of the country, hunting, and dogs. Love coming here!" "The experience this year was even better than last year at San Pedro. The hunting, accomodations, and staff was top notch. One of the best hunting trips I have ever been on. Thank you so much!!" 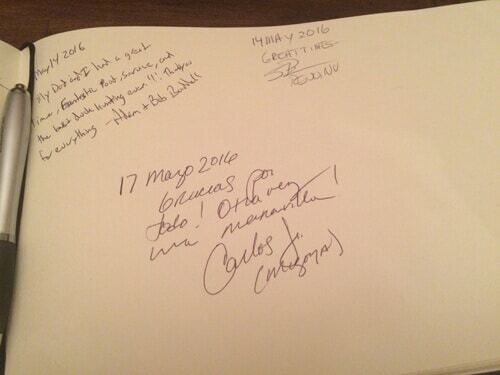 "I did not believe 2013’s visit to San Pedro could be improved, yet the experience at San Juan was better and most enjoyable. 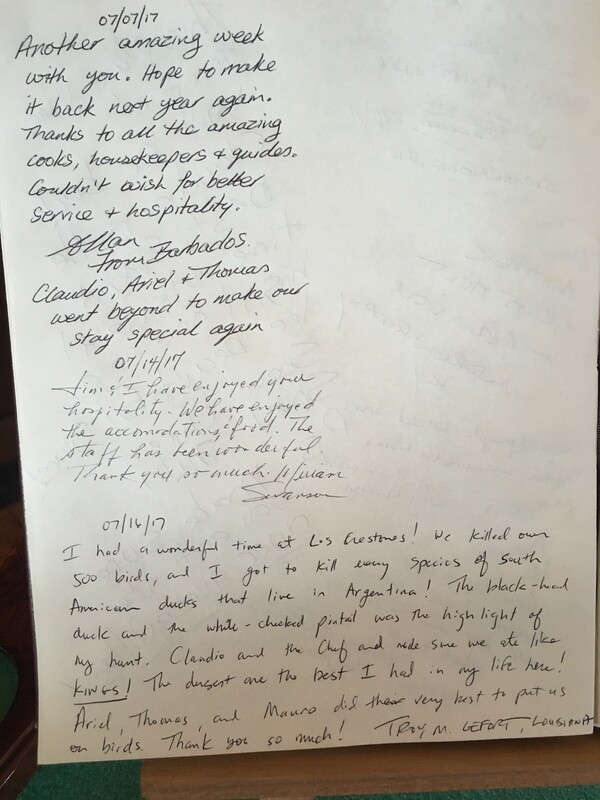 Excellent people managing San Juan, the hunts were great, and the food/lodge outstanding"
"I cannot boast anymore how wonderful the hunting, staff, lodging, and food was during our stay. I would recommend San Juan Lodge to anyone. During our stay our guide, Pablo also informed us of other David Denies properites we could visit. If they are anything like what we have experienced this week, there is no doubt about another trip!!!" "Excellent 1st class TOTAL – Total family is fantastic Bernardo -Mercedes – Sofia – Alvaro could not have been more accommodating. The Best Private bedrooms perfect." 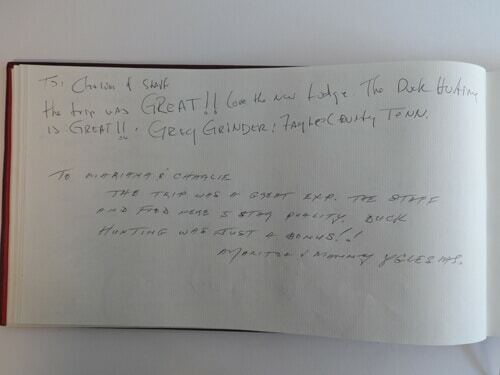 "The warm welcome, the comfortable accomadations and the hunting experience were superb." 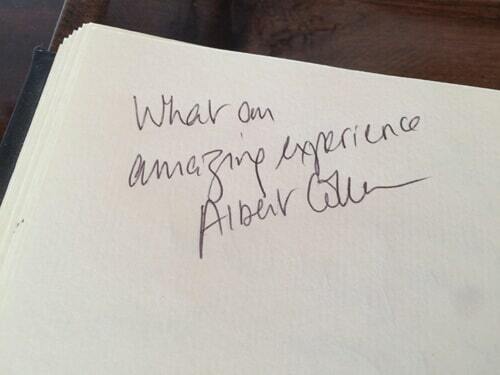 "Everything on this trip was excellent. The hosts were extrodinarily accomodating, the lodging was spotless, the food world class and the hunting was perfect. 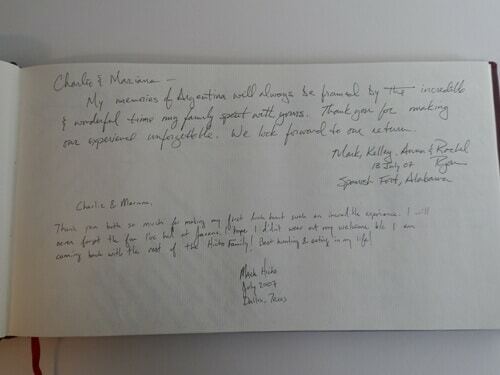 We could not have asked for a better experience." "Great mix bag hunt My first perdiz hunt. House staff, guides were uniformly excellent The family that manages the lodge is wonderful!" "The Barran lodges feel like visiting family, much warmer than visiting a hotel." 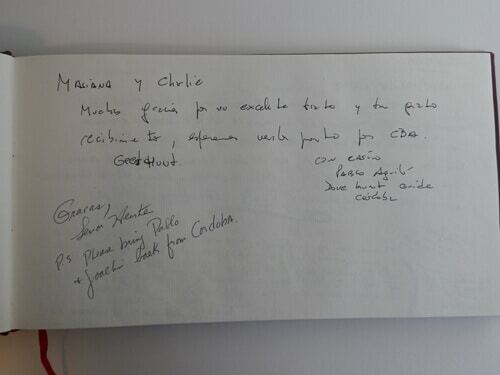 "Excellent food, staff, manager, guides, dogs, hunting." "We were catered to our every need from the beginning until the end. Food was fabulous and wingshooting was even better." "Everything was perfect. Don’t ever change anything about San Juan Lodge!" 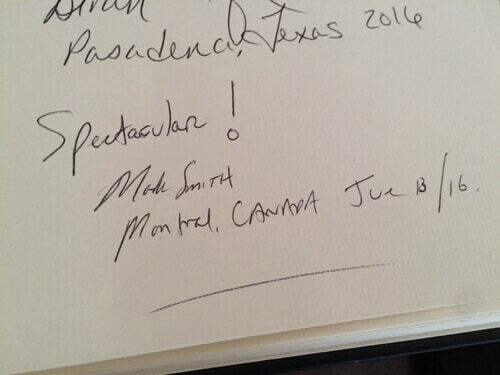 "The trip was an outstanding success! 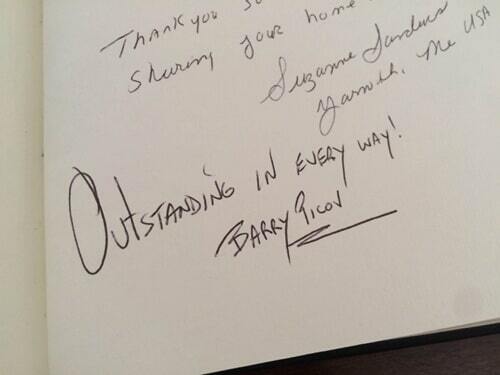 The Barran’s were gracious hosts and assured that every detail was perfect. The hunting was a bit difficult with the warmer than normal weather and the dry conditions. This made it difficult for the dogs as the perdiz ran more than usual. The food was exceptional. The guides all did a good job and we appreciated having. Bernardo in the field with us alternating with each hunting team as the guide. The dove hunting was great and challenging. 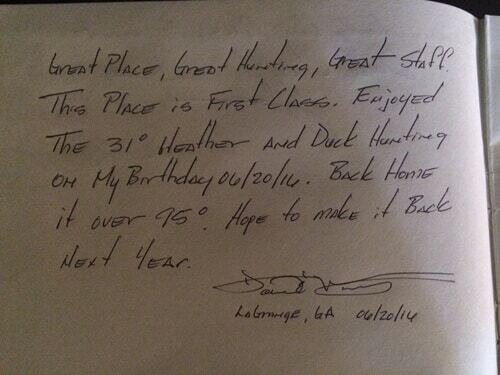 Everyone experienced the most positive hunting, dinning, lodging, service experience." "Excellent. The Barrans have a superior knowledge of the hunters needs and continue to provide a top notch service. Their staff is knowledgeable, helpful and extremely hardworking and the dogs are superb. 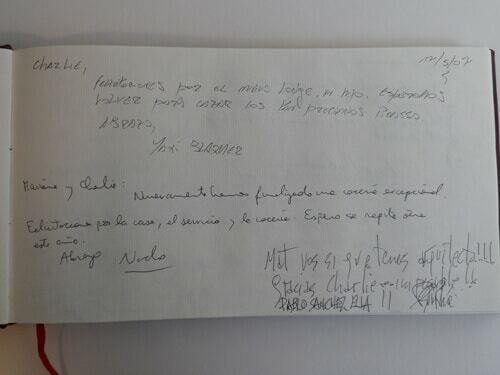 I will continue to travel to Uruguay as long as they are my hosts." 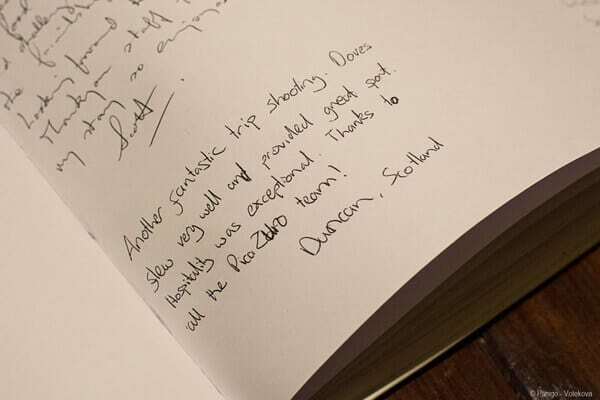 "Excellent- This was my forth trip – Looking forward to next year." "Bernardo and Mercedes are wonderful hosts and their attributes are extended to all staff. The quality of service and food exceeded all my expectations!" 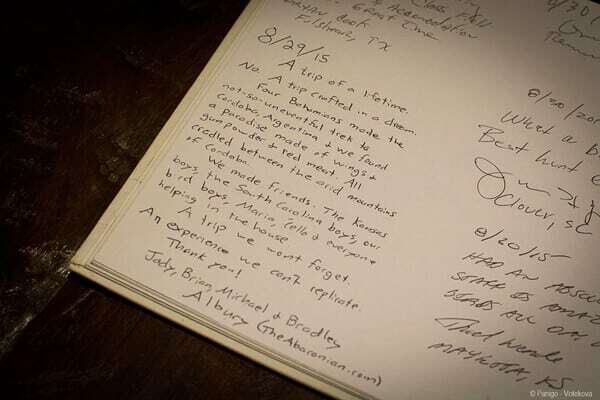 "The combination of the staff, dogs, game, lodge and food add up to a world class experience." "Incredible! Beautiful country, people fun and polite, dogs outstanding. Thank you! Names on guides and assistants would be helpful however." "Mercedes and Bernardo are wonderful hosts with staff that are always there to satisfy your every need. Ana and lead guide Martín made sure every moment was up to and exceeding expectation. Overall rating of excellent, would highly recommend to others." 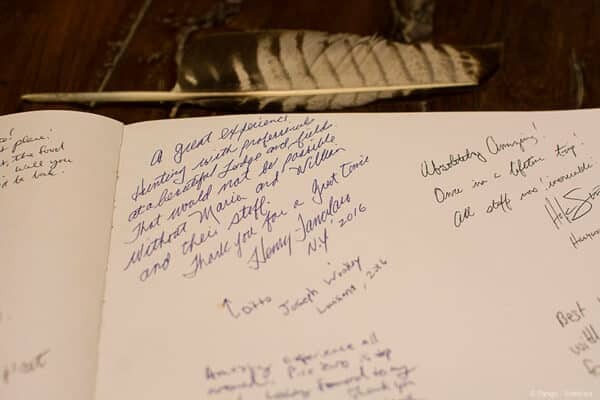 "We had an outstanding experience; the hunting was terrific not to mention the food and intimate atmosphere of the lodge. The staff was friendly and the guides were very efficient. No detail overlooked! Thank you!" 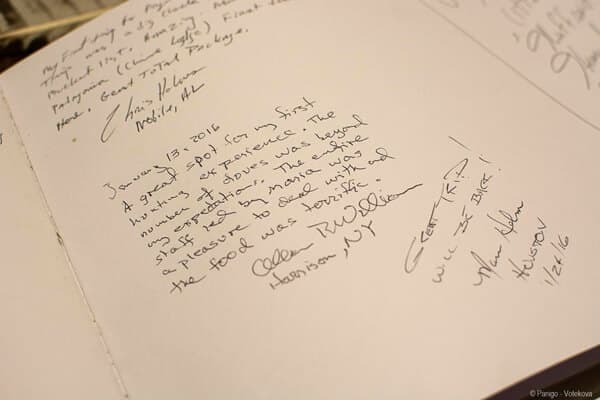 "We all had a great time at the lodge and enjoyed the hunting, food and hospitality tremendously. " 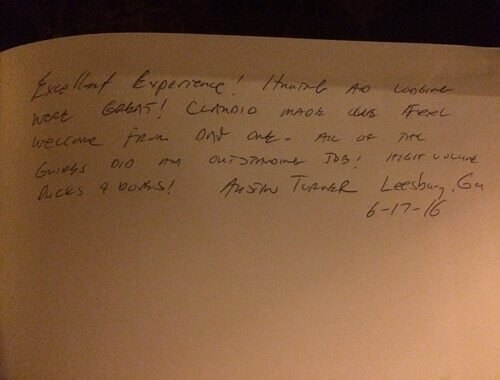 "Really enjoyed the trip and the staff was "over the top" at both locations. Both are outstanding venues, but my personal favorite is San Juan based on the ambiance. For reasons only a true & seasoned waterfowler could understand, the past week at Jacana has been added into the top 5 of greatest experiences I've had the privilege to share with others. In the my book of records of pursuing various passions, and where I've been blessed with many fantastic & unique experiences since 1959, no one could have scripted what unfolded for all of us this season. I am convinced from prior experiences, this would not have occurred without the Master of details, Charlie, orchrastrating the music as he has for many a year. You see most guns show up, expecting & thoroughly enjoying the incredible wing shooting found in Argentina. Then just as quickly, jump on a plane traveling to somewhere else. Excluding issues beyond anyone's control or the awareness of just how difficult it is for all outfitters in Argentina to provide normal simple tasks hunters expect, we're a breed that more often than not, take many of their daily difficulties & tasks as a grain of salt, not realizing that simple gun replacement parts are next to impossible to obtain, and few bring their own to shoot. So when the stardards are raised over & above all the others, and I've tried many others around the Globe, from where I sit Jacana sets the Gold standard for all others to follow and has since I first started going there about a decade ago. The week we were there saw waterfowler's from novice to lifetime hunters. We all experienced the effects of major flooding, more patos in the area I have seen since about 2007 when I first shot with Jacana. The week yeilded everyting from using Buzz-Off replant to 30mph wind, rain, cold weather & duck gear. The fireplace at Jacana was a welcomed friend sharing its warmth for many. I've witnessed many hunters determine the success of their hunts in terms of percentages or harvests. Once I too viewed that as ruler. Nowadays & more important to me is to view the marsh's wildlife, that's a beautiful thing. Harvests are just but part of the overall experience specially if one is in sync with their shooting abilities. Actually for me it falls into the bottom third of the total experience. The amigos sharing the hunts is for sure another part & the final part are those intangibles or unexpected things one hasn't anticipated. But the bottom line in all of what was previously mentioned, this area's bounty would have not been accessible if it were not for the laborious 'behind-the-scenes' efforts of Charlie & the staff he has assemnled. It's a business after all where everything is about to break, broken, under repair or parts are unobtainable & the Lodge is full of gringos who are less than understanding their Lodge rental autoloaders are rendered to single shot guns. Furthermore, hiring competent staff for such a speciality activity is totally foriegn to Argentinos, it has to be very difficult, duck calls aren't easily found South of Texas. I so do enjoy Cordoba & where the World's finest paloma experiences are found as well. For me it is in the beautiful hills north of the city that maintain some 70,000,000 birds. My first Argentina wing shooting occurred with Horacio & Jack at Pico Zuro & now continue at La Dormida. I wouldn't miss a season because of their expertise either. As we know hunting patos is a much different operation than palomas. Besides Jack & Horacio may have a difficult time shooting ducks, their too big! Hahaha! But seriously, they all have issues to deal with but constantly deliver the finest & highest quality wing shooting experiences found anywhere. But the pato outfitter has a short season, deals with such adverse elements & conditions. 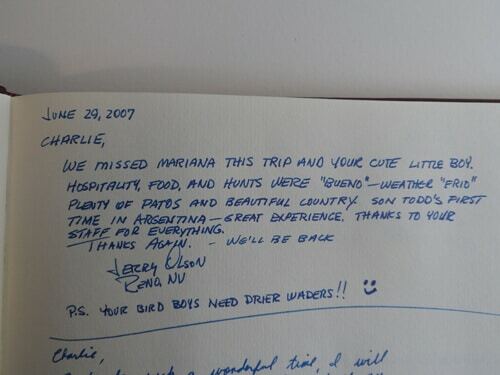 Charlie has mastered his elements & somehow manages to provide his clientele with outstanding experiences. Life simply would not be complete if I were no longer able to return to this wonderful country and visit those that have been such a great part of my family's pass time. I know dad & my wife Kathy dearly miss being here, I hope that one day Kathy will return & dad does through the eyes of his son whose eternally greatful he always had time to take his son hunting & fishing. Thank you Charlie, what you have created with Jacana for your clients is without a doubt amongst life's top 5 experiences for me. Not only am I proud to tell others about Jacana, I can't wait for next season so I can return to hunt with you again. Maybe next time, you'll be so kind as to allow me to dispatch your cripples, hahaha! 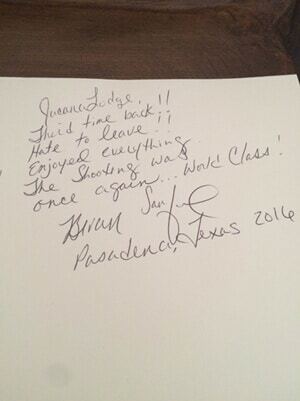 Your friend & devoted client,"
"Food, service, accommodations, hunt, guns were all first class for me! Had a wonderful time—way exceeded my expectations, and will definitely use David Denies for any future hunts. I’d love to bring my son in a couple years when he gets a bit older (14 right now). " others. The other thing is 4 hours from BA to Jacana is a long drive. way thanks again for copying the music for me. I play it often. "Amazing trip. Well worth it. The volume and quality if the shooting was great. Having such beautiful birds finish into the decoys over and over again isn’t something we get back home. Amazing habitat and good guides as well. Frank was very, very good and made the experience very enjoyable. You could tell he enjoyed it as much as I did. His knowledge of local wildlife, etc, even the non-duck life, was amazing. The food was very good as was the ability to control the AC in the room. Courtney really liked the horseback ride as well. The Clothing & Equipment section on the attached doesn’t make it clear when it mentions waders that they have some at the lodge. That would have made packing much more easier. Maybe also note that waders can be provided in the important accessories for the field section of the same document. Maybe also ask the hunter about choke selection before they go out? I’m not very knowledgeable about chokes for lead, but maybe let the guest know what chokes are in the gun standard? "Cory and I had a great time at Jacana!!! It was soooo worth it ! #1- The lodge was beautiful, great rooms very clean and comfortable. #2- Service was 10, you guys had everything waiting for us or made it a priority to get what we wanted. #3- Food was awesome, you had a great staff in the kitchen, I give it a 10. #4- The service in the field was good, nice trucks and with that amount of mud and water we had during our stay it was amazing we got to our destinations. #5- The guides were great, got us on the birds and were excited to hunt every day. The only thing that was a issue was the English barrier but we got through it and we needed to brush up on our Spanish too. #6- We were in awe on the amounts of birds, it was like nothing we have ever seen before. Great bunch of guys, it was just amazing!! #7- Thinking back I cant recall much I would change, it was just a great time. One thing does stick out- the robo duck batteries, but I think you guys fixed that at the end. Keep up the good work you guys made the trip outstanding. Thank you again for giving us a hunt that will always be in our memories, it will not be the last time you see us. We will be coming back!! I would love to bring a whole group of friends and family next time. "Very good organization, very nice people, wonderful duck hunting." "The hunting is fab. The lodge is very nice. The help and service is wonderful. Great experience." "More ducks than I can imagine shooting in the states in a single season"
"Everyone here was so nice and helpful. They made this trip into a very relaxing and fun vacation." "This is my 11th time, in 10 different years. Always the best duck hunting experience." "Shooting was great, more than I expected. 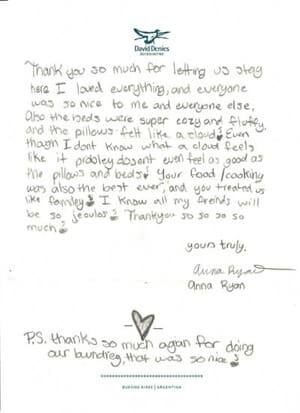 Accomadations and staff were exceptional as was the food." "I brought my two sons with me and wanted to make sure we were taken care of. The concern for saftey and or needs exceeded my expectations." 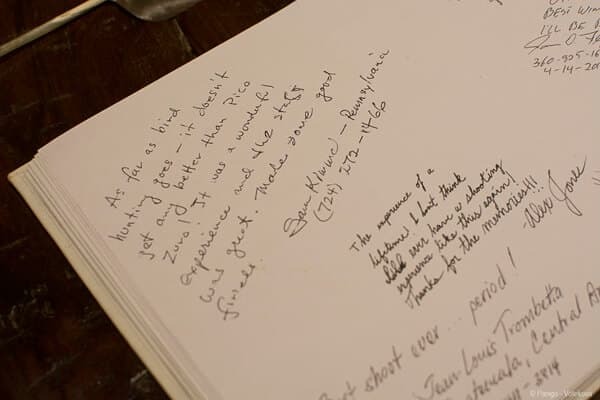 "The experience has been the best, by far of all of the bird hunting destinations that I have been to. Hopefully,I will return someday"
"From start to finish it was a fantastic trip. My hats off to the team @ Jacana. They are wonderfull!!!" "If God made anything better, he kept it for himself." "My overall experience was absolutely amazing!. I even impressed myself with some of my shooting which came from the challenge of the guides and field staff. I look forward to returning!" 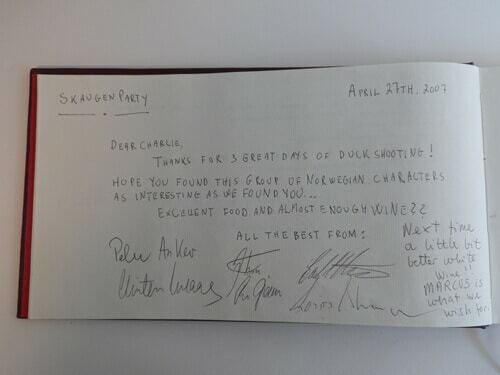 "Charlie and crew were excellent. The food: Spectacular. The shooting: best I’ve ever experienced." "Everything was as near perfect as it could be. From the time we got off the plane till the time we got back on (your airport people were great!!!!!) we had nothing but a great time, and everything flowed really well." "We thought the lodge was great, food excellent, great rooms and even the shell allowance found the correct balance. Bird boys were without fault and very professional, I was impressed with the variety of locations and the quality of sport offered and the organisation was seamless, full marks to Charlie for getting us up every morning, I couldn’t do that all season. I have already told my shooting friends about the trip, their most important question was ‘Would you go back’? The answer was YES!!" "Thank you so much for having Sam and I at the Jacana Lodge. We both had a wonderful time. I thought for a long time about the question you had about what improvements you should make. I don’t think you should change any thing. Your attention to detail and no confusion about how things are run made the whole experience a great time. We will never forget our hunt with you at Jacana. Again thank you so much. My NEW life goal is to return to Jacana." 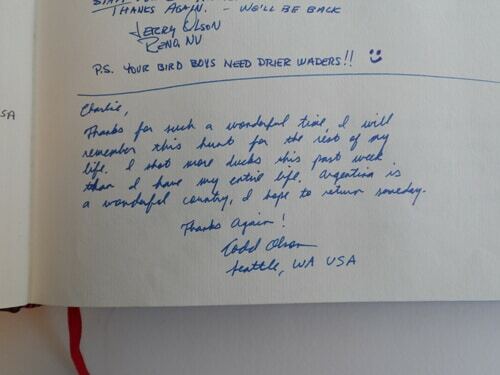 "I had a blast in Argentina shooting ducks with Charlie. The Lodge is FIRST CLASS and the shooting is FIRST CLASS. I cannot say enough GOOD about the food, the service, Charlie and his team. They are the BEST, FIRST CLASS. Hard to come home to reality after that trip." 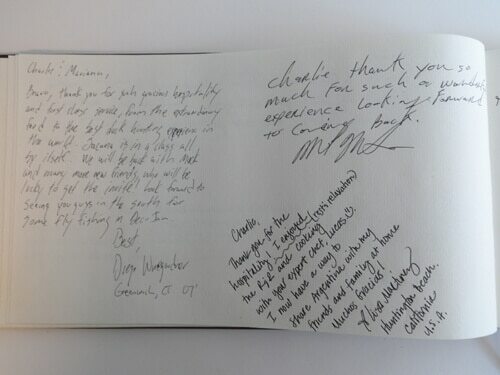 "This experience was excellent in all aspects. The duck hunting has to be the best in the world. There is nothing more I could want in a hunting trip." "Had an amazing time. The lodge and meals are fantastic. The hunting was even better." "Absolutely impeccable! By far the best hunting trip I have ever been on. The meals were incredible and only superceded by the quality of the hunting itself. Without question one of the finest establishments I have ever visited. I cannot thank you enough!" 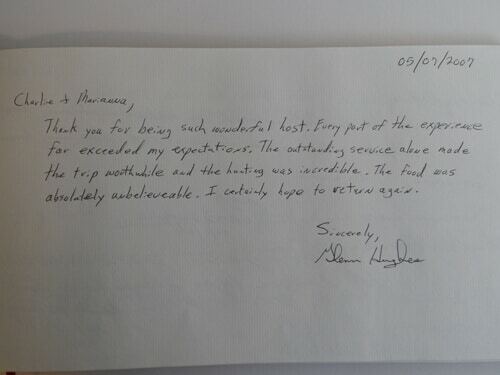 "Everything was excellent. Great food, hunting and company. Bird boys were all super guys. Thanks guys had a blast." 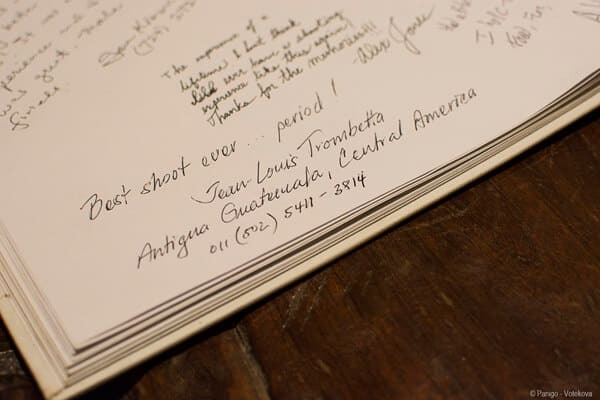 "Everything was perfect at Los Crestones, food, service, shooting were exceptional! Our group is already discussing our next trip, let me know when you start booking the next season. Once again thank you for all support!" 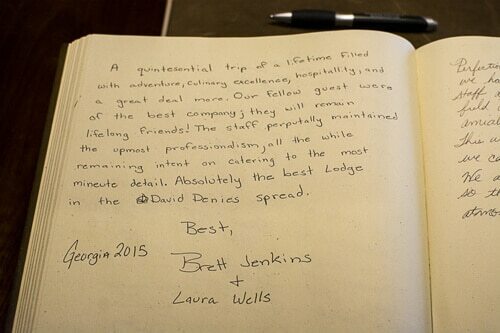 "My experience at the lodge was super. Best food I have had anywhere. Wonderful wine (would like a list of the red wines they served). The staff was excellent--could not have asked for a better experience. In my judgment, you have a winning team working at the lodge. The hunts were well organized and a very good experience. Would recommend it to anyone." 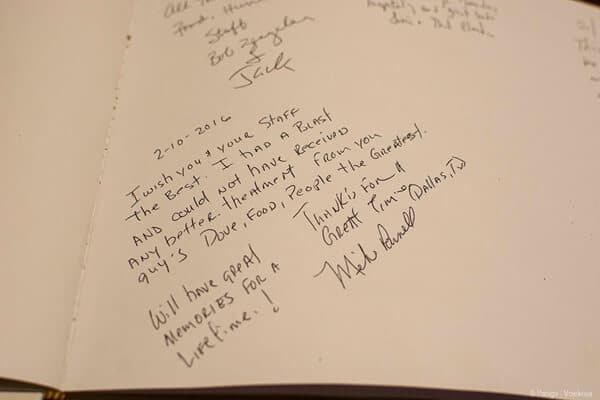 "The lodge and the staff were top notch. Your personal service and attention to detail were second to none!! I appreciated your operation more once I left and visited Jacana. The organization in the lodge and especially the field at Los Crestones was superior. Thanks again and Los Crestones is top on my list of placing to visit again. 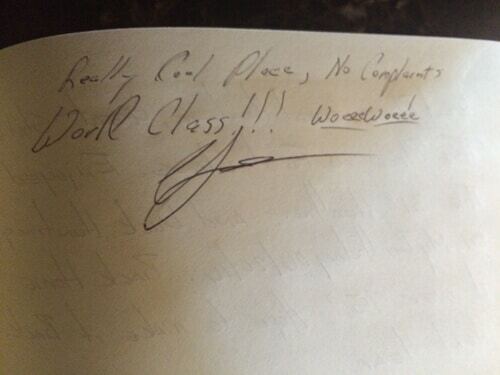 "Everything was first class and you staff was outstanding. The guides did a great job as well. " "Everything was fantastic . You and Barry looked after me always with coffee and diet pepsis without me even having to ask. You both are very professional at your job and you sincerely take care of your guest . If the guys come back next year I will definitely be with them . Thank you very much for caring and hope to see you next year"
"GREAT JOB BY YOU AND STAFF!!! RETURN WILL COME BACK TO LOS CRESTONES FOR SURE!!!" "Thank you very much I enjoyed my self and you and the staff did a wonderful job! I will see you again next year! 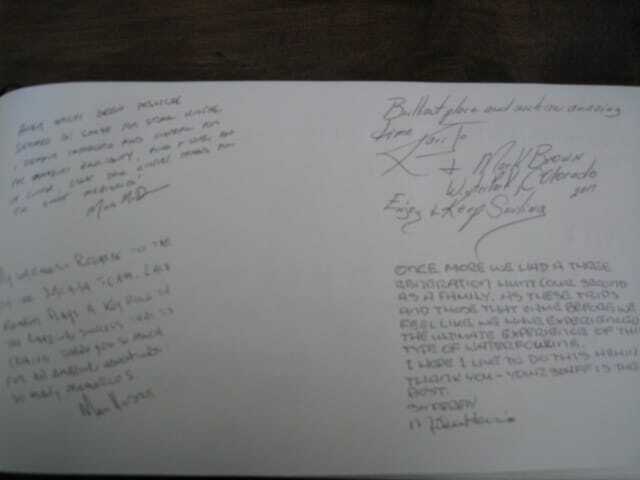 "Thank you so much for taking such great care of Dylan, Dalton and me. A very special trip for a dad and sons. Truly a trip of a lifetime. 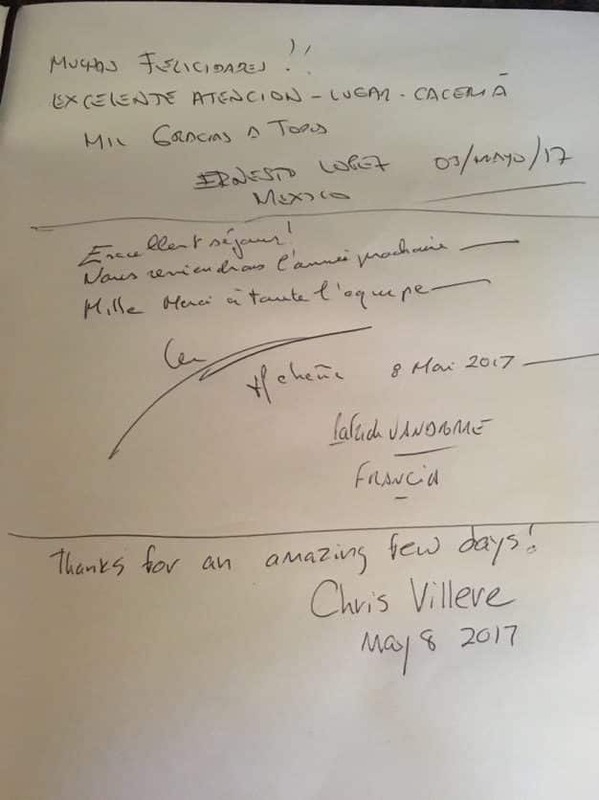 Thanks to you Tomas, Mauro, Ariel (and Charlie) and the entire staff. Thank you also for the travel assistance. All details were flawless. The hunting was outstanding and the hospitality and accommodations equally excellent. "Well done, staff were excellent. Cheffing really good accommodation comfortable and you and the staff could not have been more attentive. You personally anticipated our every need and are at the top of your profession." 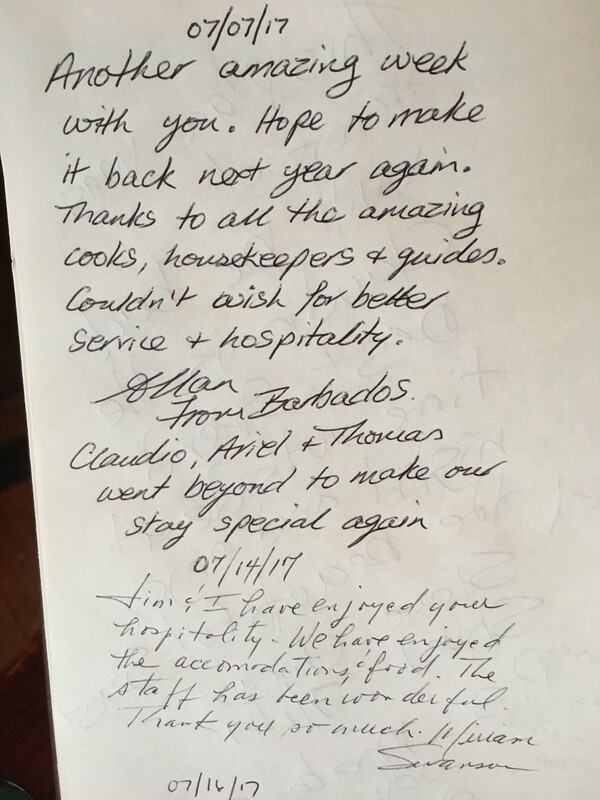 "Great to hear from you and yes again we all really enjoyed your service and food .... All excellent and thank you again." 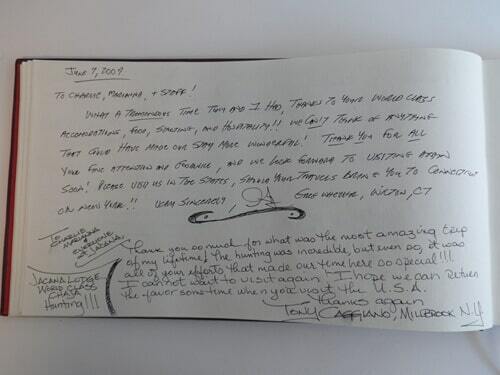 "I wanted to thank you again for an amazing trip! 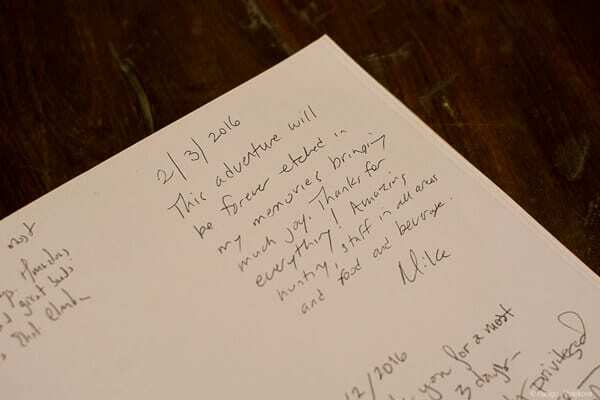 You and your team went out of your way to make sure that our trip was memorable. From the new cocktails each day, to the unsolicited ice tea, to the doppio each morning, you all did not miss a single detail when it came to our comfort and enjoyment. And of course the hunting is something you can only experience in Argentina. So thank you again for making our trip so incredible and memorable. If you are ever in Austin I hope you will allow us to return the favor. "Thanks for asking…. 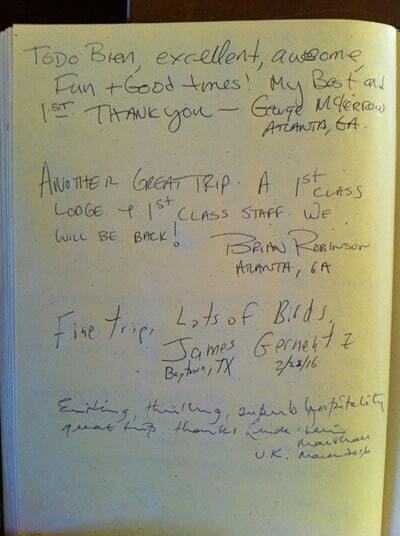 Everything was first class and you and your staff made us feel right at home. I would not hesitate to recommend others to join you and hope to be back in the future!" 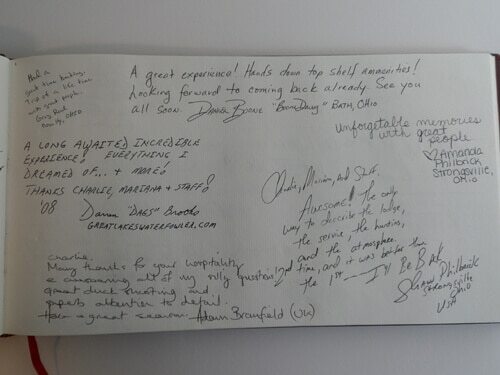 "Thank you again for making our trip so enjoyable! Cannot wait to make a return visit! I really did enjoy the new Los Crestones. The lodge was fantastic! I would say this lodge had the best service, food, and accommodations. It was lacking a hot tub which would have been nice. I know we have been to Pico Zuro before and after the hot tub was added. A hot tub would be a nice addition at Los Crestones. Claudio was the best host and kept us fully entertained with his cruise ship stories. We enjoyed the specialty cocktails upon returning from the hunt and thought the champagne toast on the last evening was a nice touch." "Food, drink, hunting was great. 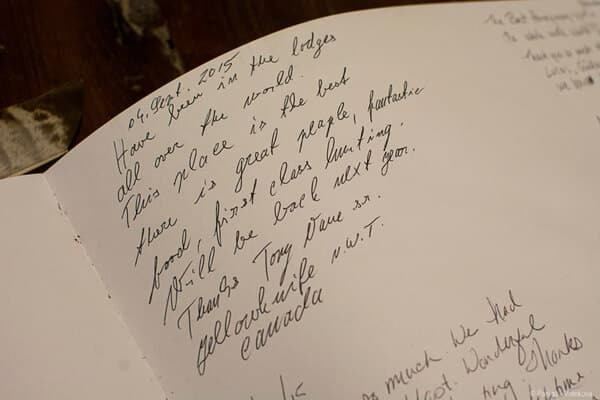 The lodge is amazing." "Very good hunts, people and attitudes! Claudio and the ladies were excellent! Charlie Stewartwood did a fabolous job with us all and my son especially." "Excellent! Two many words can go in this box but I will emphasize how amazed I was at the volume of the hunting and the quality of the service, Bravo!" 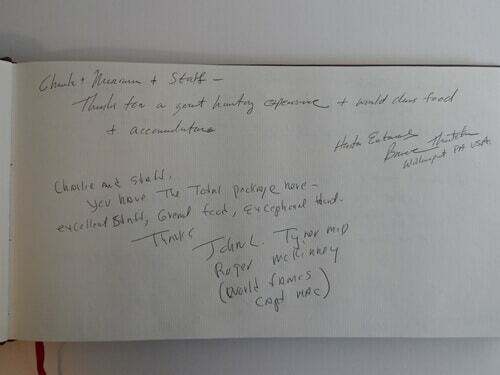 "House manager, house staff, and hunting staff all were excellent. Food was amazing. Black Buck hunt went very well. Well organized and friendly staff. Lots of shooting- why you come to Argentina!" "The hunting was as good as I expected, but the lodge was much better than I had expected." "Very impressive. 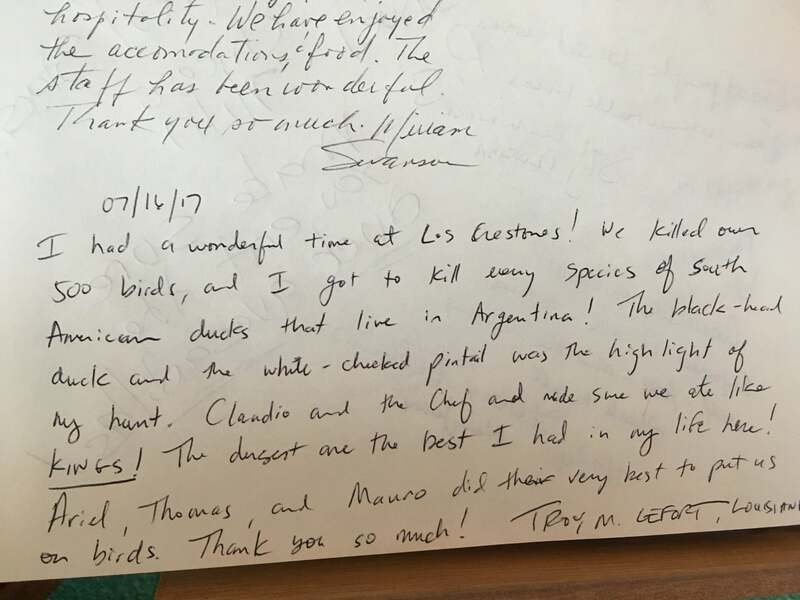 This was my first time in argentina to hunt and it exceeded my expectations"
"Very good. I will return. 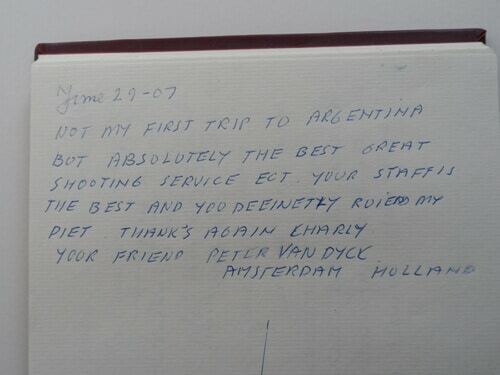 Special recognition to claudio who made each of us feel special"
"The entire experience was first rate. 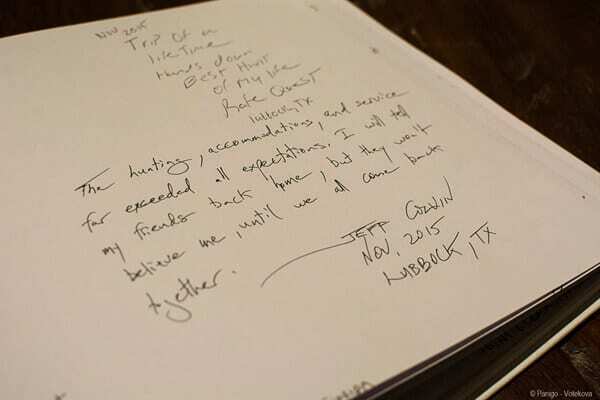 The staff went above and beyond to make my stay a memorable one." 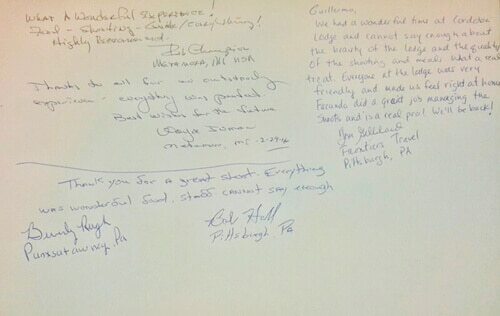 "Every aspect of our stay was well thought out and performed with ease. Meals were Gourmet. New Los Crestones lodge is spectacular. Guides as always do a great job." 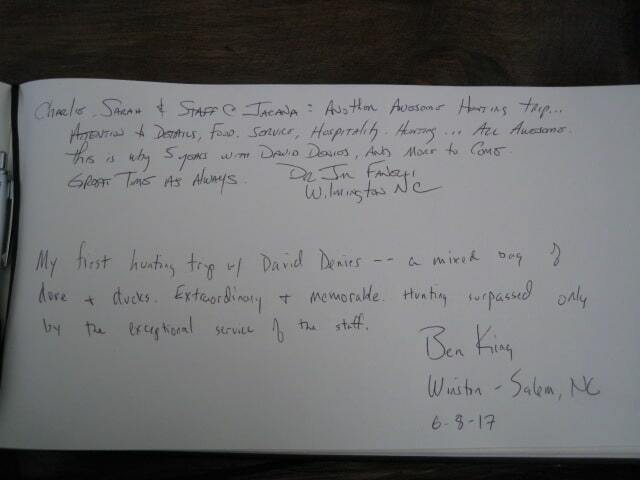 "Every aspect of the stay and hunts were excellent, and the people you have are amable and service oriented without hanging over you." "Awesome first two days of duck hunting. Sebastian,Magdalena, Patricia. The guides and staff were excellent." "First class. Will be back." "Wonderful, loved every minute of it. Bravo!! Atmosphere is perfect, single rooms fantastic. Very professional staff." "Great atmosphere and professional staff. Great time. Difficult to return home." "Exceeded expectations. First class in all areas. What memories are made of…!" 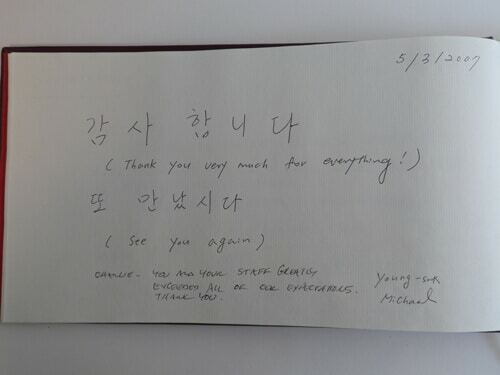 "We enjoyed very much our stay and hope to come back soon. Guides were outstanding!" "Most elegant hunting experience of my life. Most productive too!" "Great Experience! Argentina is truly the most fascinating place to hunt ducks in the world!! 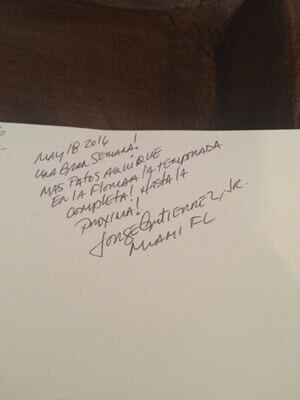 God bless the country and the wonderful people at Los Crestones who make it all possible." Not kidding. EVERYTHING! All aspects of the lodge had such attention to detail. Thanks to Claudio and his team. "Just got home last night from Córdoba. Marc and I had a great time. The pigeon lodge was wonderful. The hunting was great with a limit each shoot. The staff was wonderful"
"My stay was excellent in all ways!. The staff was outstanding, very warm people, and a pleasure to be with. The Lodge is very pretty and well. The shooting was magnificent and overall, the total experience could not have been better. Many thanks!" "Exceeded our expectations (my wife´s & I). We were so impressed with Montaraz that we canceled a night in Mendoza to stay another night here. World class Lodge an at-home atmosphere. The decoying pigeons are something every wing shooter should experience at least once in their life time." "This is a top Lodge and I would highly recommend it to anyone who is passionate for dove shooting." 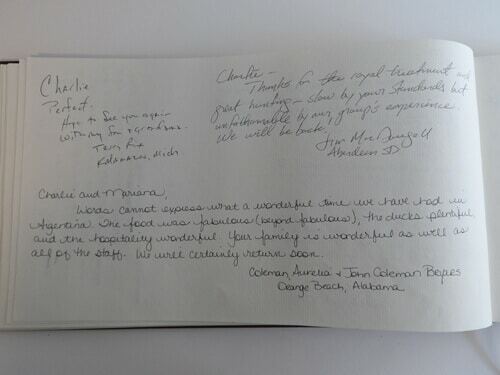 "The entire experience was a pleasure and beautifully handled by all staff." "Very enjoyable and relaxing. Amazing amount of birds. Very accommodating staff." 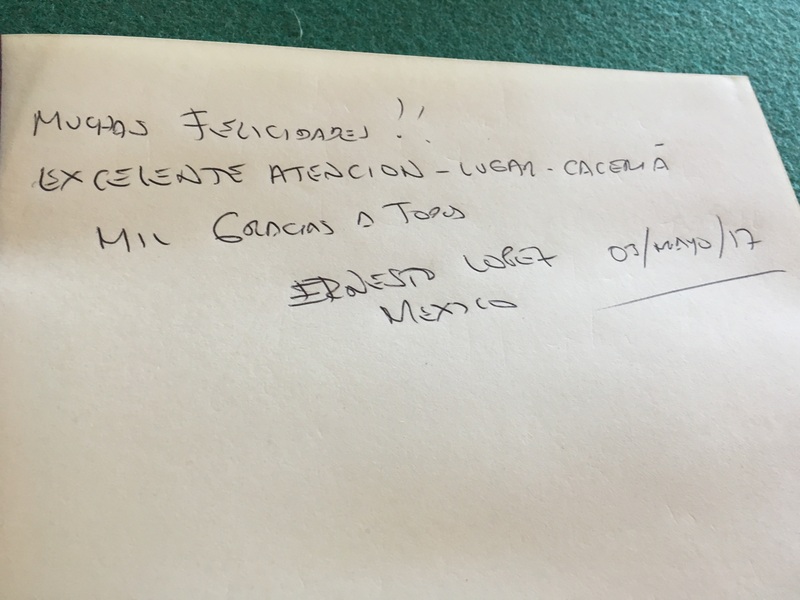 "We were extremely impressed by the Estancia Montaraz. The room was beautiful & we had a fire waiting in the fireplace when we arrived. The house is very accommodating. Our expectations were exceeded by far!" "Excellent! The lodge far exceeded our expectations. The shooting was consistently good."